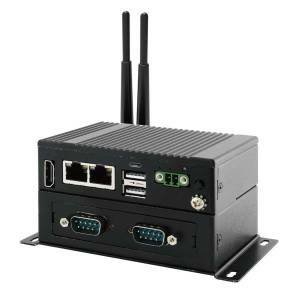 The new industrial IoT Gateways EACIL22S-100-A464 and EACIL22S-101-A464 were designed with low power consumption processor Intel Apollo Lake N3350 with 1.1GHz clock frequency. These compacts systems can be equipped with 4GB LPDDR3 (by default) with 64GB onboard eMMC storage memory. The novelty was equipped with fanless metal housing and can be mounted to Desk, Wall or via VESA(optional). Thanks to the easy installation ensures and compact size (100 x 115 x 31 mm) that makes EACIL22S suitable for IIoT, various industrial applications and factory automation. As graphic controller the EACIL22S has integrated Intel HD Graphics. For transferring USB data, deliver power (up to 10W, 5V/2A) or A/V output as Display Port the system has USB Type C port with Alt-mode, which combines all these three functions. Thanks to “USB Type C Alt mode cable” user has the ability to use only one cable, especially in places with limited space. The system supports wide range of input voltages between 9 and 36V DC. There are available 2 products for order: EACIL22S-100-A464 and EACIL22S-101-A464(with additional Wi-Fi module and two Antennas).